The fledgling integrated newsroom at Bloomington’s public radio and TV station is making strides toward keeping the public informed whether they are watching, listening or using the Web to get their news, according to WTIU/WFIU’s news director Sara Wittmeyer, who spoke to the press club Oct. 24. The newsroom brings together reporting and news production for both stations and the news website, Indiana Public Media. In just over a year into her tenure as the first director of the converged newsroom, Wittmeyer said the project is off to a running start. The master’s program, in collaboration with the School of Journalism, supplies several students whose course work feeds that tripling of news content. Wittmeyer also takes on volunteers and interns, both undergradaute and graduate level, who learn while working as reporters, videographers or audio producers. Wittmeyer plans to add to her total of about 40 students working in the newsroom both as a way for students to learn and get experience, and for the station to continue to increase its news coverage. 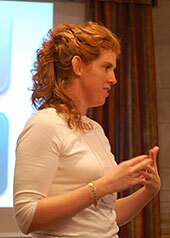 A converged or integrated newsroom depends on this, she explained. “Converged” means a reporter may prepare a video report for the WTIU news show, then edit a shorter clip to post to the website. This new clip may be accompanied by a text story, podcast or still photos. Website readers have access to stories with varying multimedia components, and reporters and producers have to think in terms of several media platforms, not just a radio piece or a Web story. Wittmeyer said she hopes to have enough people on staff to focus on creating more documentaries. She said station managers know the news divisions don’t necessarily bring in money, but projects such as documentaries provide in-depth examinations of news issues. A documentary about I-69, the interstate highway under construction across southwestern Indiana, is in production now. 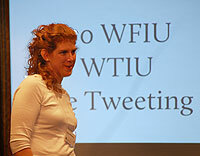 WFIU/WTIU also received a grant earlier this year to work with NPR and other affiliates on covering education. State Impact Indiana is a collaboration between WFIU, WTIU, Indiana Public Broadcasting and seven other public broadcasting stations around the state to report on education issues. Wittmeyer said new programs, along with existing favorites such as Noon Edition and Ask the Mayor, are geared to keeping people informed through whatever media they choose. This entry was posted on Monday, October 31st, 2011 at 5:47 pm and is filed under Guest speakers. You can follow any responses to this entry through the RSS 2.0 feed. Both comments and pings are currently closed.